Media: Soft cover, 64 pages plus covers, b&w with 8 pages in full colour. Advantages: English and Italian text; beautiful model photos; ample detail and operational photographs including wartime colour shots; technical drawings; very attractive profiles. Maurizio di Terlizzi brings the weight of his technical understanding and his superb modelling skills to all of his books. Aviolibri Special No. 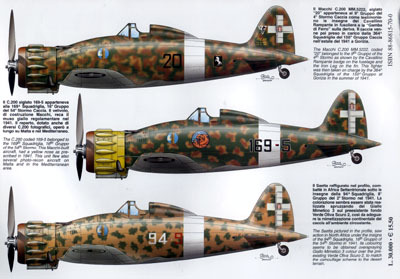 5, "Macchi MC.200 Saetta - Part One", clearly demonstrates these traits. This book is pitched specifically at the modeller. It is packed with detail and operational photos of this beautiful aircraft. The text briefly describes the development of the prototype, operations, camouflage and markings. Six colour profiles provide examples of the wide range of schemes seen on the Saetta. This reference material is rounded out with scale drawings of the prototype and Serie I aircraft. Another highlight of this book is the author's analysis of the 1/48 scale models from Astrokit and Classic Airframes. These articles are supported by colour photos of the models completed and under construction. The text contains some helpful hints to ease construction and improve the accuracy of both kits. Text and captions are presented in both Italian and English. The English text is slightly quirky (presumably as a result of literal translation), but quite easily understood. 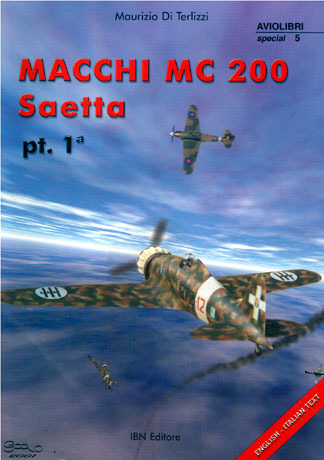 "Macchi MC.200 Saetta - Part One" will be a valuable resource to modellers building either the Astrokit or the Classic Airframes model. Thanks to Ken at Pacific Coast Models for the review sample.